OLV tweeted yesterday that Catching Fire was rumored to be filming at the Marriott Marquis in downtown Atlanta again (they previously filmed on the roof of the hotel). That looks to be the case as one of our readers – thanks, Stephanie! – shared this photo with us of Peacekeepers stationed inside the hotel. 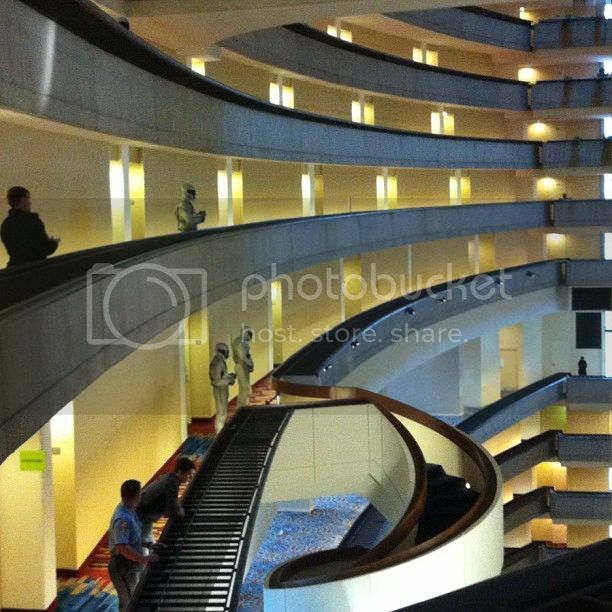 The Facebook user who posted the photo said “Hunger Games 2 is filming in my hotel right now. I just saw Woody Harrelson.” Must be some scene from the Capitol!